Dr. Lowell Broom, CPA, joined Samford University’s Brock School of Business in August of 2008 from the University of Alabama at Birmingham where he served as Associate Dean of UAB’s Business School and Chair of the Department of Accounting and Information Systems during a 21 year tenure of employment at UAB. At the Brock School of Business he served as Chair of the Department of Accounting and Management Information Systems until August of 2015 and is now Professor of Accounting. Early in his career he was a part of the professional audit staff on the “Ernst” side of what is now Ernst & Young in Jackson, Miss. He began his teaching career at Louisiana Tech University and also served on the accounting faculty at Baylor University for 5 years before moving to Birmingham in the late nineteen eighties. 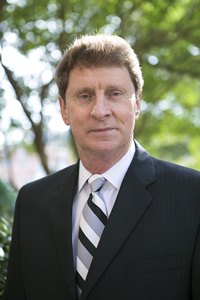 Lowell also has served as a consultant to several organizations during his academic career and has developed and taught numerous CPE courses for accounting professionals throughout the southeastern United States. He also has served as an expert witness on numerous occasions including the Jefferson County, Alabama, bankruptcy litigation which was, at the time, the largest municipal bankruptcy filing in the history of the United States. He has written or co-written a number of publications on accounting topics ranging from the application of generally accepted accounting and auditing standards to ethical conduct and fraud detection. Over his career Lowell has received several recognitions including excellence in teaching awards at Baylor University, UAB, and Samford. He received the Thomas A. Ratcliffe Outstanding Discussion Leader Award from the Alabama Society of Certified Public Accountants (ASCPA) in 1996 and was named as the Alabama Outstanding Educator of the Year by that same organization in 2000. In 2004, Lowell was appointed by Gov. Bob Riley to serve as a technical advisor to the Small Business Committee of the Governor’s Black Belt Action Committee. The committee was responsible for developing and implementing a plan to promote economic growth and improve the quality of life in Alabama’s Black Belt. In 2007, he was appointed by Gov. Bob Riley as the Chair of the Economic Development Committee for Region 3 (Central Alabama) of the Rural Alabama Action Commission. That commission was responsible for implementing economic development opportunities in the rural areas of a seven county in North Central Alabama. Lowell served as the 2015-16 Chairman of the nearly 7,000 member Alabama Society of Certified Public Accountants and as a Member of Council of the 400,000+ member American Institute of Certified Public Accountants. He is a member of the American Institute of Certified Public Accountants, American Accounting Association, and the Alabama Society of Certified Public Accountants.